During a recent antique jaunt I came across this fabulous old dressing table. 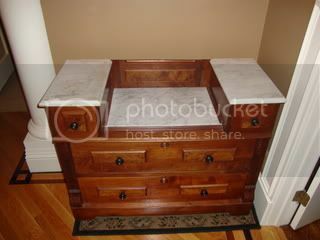 This beautiful old piece is covered with beveled marble and has dove tail drawers. The piece is on wheels and has beautiful carvings along the side. There are keyholes to lock the draws but sadly the key is missing. Also there must have been a mirror attached which is long gone. The condition was really super for a thrift store! Since I had no use for this great piece of furniture, I quickly sent a text message to my sister who was on vacation to see if she was interested. She said yes! Yippee! I just couldn't leave this gem behind. So here it is delivered and in place! I forgot the polish so it hasn't even been cleaned and still looks this super. 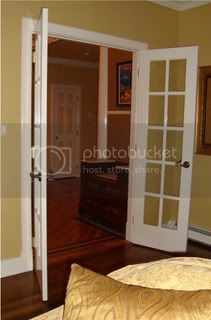 Now all she needs is a little vignette to make this piece feel cozy in her foyer. 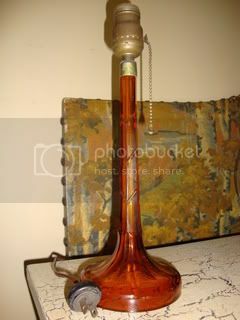 I was thinking about giving her this awesome deco style amber glass lamp. 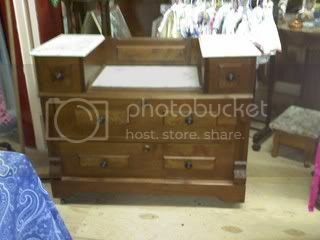 It would look super sitting on this chest. I just picked it up this weekend at a garage sale. Isn't it pretty? I need to find a shade that works with it. Now that is the story of my life; too many lamps, not enough shades. That is a blog entry for another day. I simply can't resist a pretty old lamp! But then..lol maybe I am! There was a woman who commented on my "ant" post..her name is Jean. She apparently has no blog..but did list interests so I clicked on those..which led me to a list of people..and I saw A Vintage Girl..clicked on you, which lead me to Cottage Charisma!! and that's how I discovered your blog! The dressing table..is just gorgeous! What a find! I go to garage sales every single Saturday with my husband. It's an adventure and a treasure hunt and one of my favorite things to do. My husband just had knee surgery so we have missed the past three Saturdays and it was like going through withdrawal! We missed it so much.. I am so pleased to have found your blog and I am looking forward to another visit. We seem to have many of the same interests, i.e. old houses, antiquing, etc. The home you feature in your header is lovely! Is it yours? To have such a home must be fantastic! Again, thank you for writing. I hope to see you again. p.s. I was going to follow you, but could not find a place to do so.